One of my favourite of Shakespeare’s plays, my copy of King Lear dates from 1922. On April 23rd, 1616, William Shakespeare died. If you’re any good at math, which I’m not, you’ll know that that was 400 years ago. This milestone is a terrific excuse for Bard lovers to produce even more material about good old Will. I happen to be one of those Shakespeare enthusiasts, but that doesn’t mean I don’t know the frustration his work often elicits. His position in the Western canon means that he is frequently assigned to high school or college students, many of whom suffer through “thee” and “thou,” and leave Shakespeare 101 with a decided bias against the Bard. Now I, as I’ve said, happen to love Shakespeare. Perhaps this is because I had a series of excellent high school teachers and college professors who taught his works in ways that were exhilarating, provocative, and memorable. Whatever the reason, from these happy experiences I’ve gained a few suggestions on how to make your own Shakespeare experience a fulfilling one. Here they are, and I hope they help you! Welcome to my freshly launched site, An Olive Sea! What do you think? I hope you like the new look as much as I do. If you’re new here, thank you for joining me! May I offer you some tea? The kettle is always on (or the coffee pot – we’re fond of all warm drinks). An Olive Sea is an amalgamation of my two previous blogs, Olive Writes and Olive Reads. You can read about how they came about on my About page, if you wish. An Olive Sea is all about imagination, elegance, and discovery. I love reading, fine teas, eye-catching outfits, and gentle travels through the world. If you share these loves, I think you’ll like it here. To stay up to date on all my posts, don’t forget to subscribe! Is reading a ritual for you? In other words, is it more than picking up a book and starting to read? Reading is a ritual and a luxury for me. As such, when I do open a book it is more than plonking myself down in a chair. I need to create the right ambience, the right setting. I also need a little something to eat and drink. What I’m reading often dictates what I choose to enjoy with it. A mystery usually needs tea (black) and a cookie or a slice of cake. Poetry needs a small glass of sherry, plays a strong coffee. Some people like to attend wine and food pairings, but I’ve just had a brilliant business idea: book, food, and drink pairings! While I get starting on my business plan, you tell me what you like to eat and drink while you read. Pinch, punch, first of the month! A happy October to all. This is the true autumn month for me: orange is everywhere, pumpkin sneaks its way into every kind of food, and, best of all, the leaves are ripe for crunching. I ushered in the season with a new blue duffel coat and some preppy tan loafers. (Oops! How did you end up in my shopping cart, silly shoes.) To even out this selfish splurge, I thought I would usher your October with a very special giveaway! And what is Olive giving away? Only a lovely copy of her favourite Barbara Pym novel, A Glass of Blessings. The contest is open worldwide and will run until October 8th. You have a few ways to enter — just use the form below. May the best reader win! This giveaway is now closed! Come back for more soon. What the heck is a “Friday Forge-on,” you ask? Just a little treat I dreamed up to lead my readers gracefully into the weekend. You can read about it here. Without meaning to sound contrary, I don’t like being asked what my “favourites” are: colours, movies, flowers, even books. I just can’t decide on one! There is one exception, however: for the past year I’ve prized one poet about all others. 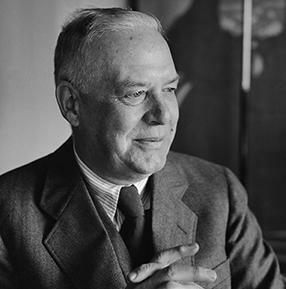 By the title of this post, you’ve probably guessed that it’s Wallace Stevens. I fell into him a year ago, and I’m almost afraid of that day when he loses his position as the poet for me. I’ll offer more biographic detail of him for you one day, but for now you can savour one of my favourite (and one of Stevens’ best known) poems. Let’s say it’s a drizzly, early fall afternoon in London, 1948. In a flat in Pimlico, a woman sits quietly revising a novel.We ring the bell and, although uninvited, the kettle is put on, bread and butter are brought out, and we sit down to chat with author Barbara Pym. Should I stop this little fantasy here? Maybe you haven’t heard of Pym? I hadn’t until Alexandra McCall Smith (Mr. No. 1 Ladies Detective Agency) championed her 1952 novel, Excellent Women, in a 2008 article in The Guardian. What luck I did find her! Pym is an author whose oeuvre I dread finishing, only to know that I will read her again and again. Great, you say. But what does this Pym write about? First of all, if you’re into the school of “write what you know,” Pym’s your woman. What she knew, broadly, was this: church life, academic life (she read English Literature at St. Hilda’s College, Oxford), Italy and the Wrens (she was posted to Naples in 1944), and anthropology (from her work at the International African Institute in London). From this collection of experiences, Pym sets down a group of characters (the more you read, the more familiar they become) and lets their lives cyclically unwind across the seasons of a year. Much has been made of Pym’s focus on the everyday, the small detail (it’s hard to find her named without coming across Jane Austen at the same time). This is true. The minutia of life is gently and methodically enacted in her works but, despite the cups of tea and cake, the clergymen, and the — dare I say it — feminine details, Pym is not saccharine. She offers dry humor and a touch of modern existentialism, but always with a deft hand. There is never too much of anything in Pym’s world. Moderation rules. I think this is what is attractive to me, at least, in her work. Just as she lays her plots against the natural balance of the year’s unfolding, her characters’ navigate a post-WWII world that, through glimpses, we can see is precarious, but which we also discover was liveable and well-lived. The Barbara Pym Society (must of the above biographic details are taken from their excellent site). Please smoke–but don’t drop ashes! Tomorrow is the autumnal equinox, which maybe explains why I’ve started to “draw in,” if only mentally. I love a bit of cozy: warm fires, woven blankets, and books. Books that ooze indoor comforts and give me a little excuse to put the kettle on just a few more times a day. One of the best for doing this is my old friend The Haunted Bookshop. Written in 1919 (handy because the book is now in the public domain) by Christopher Morley, it features a suspenseful little mystery that’s really just a vehicle to let our hero, bookstore owner Roger Mifflin, extol the power and wonder of books. There are plenty of warm fires to be had in this Brooklyn shop, and Mr. Mifflin would be happy for you to join him in front of one. I come every year and he’s always happy to see me. I find it difficult to review a book that, in the period since its 1961 publication, has become a modern classic. Whatever I want to say comes out like an essay and, hallelujah, having graduated in May, I’m on a break from those. Thus (oh no: essay speak) I’m going to offer not another critical analysis of this worthy piece of writing, but my emotional, almost immediate impression of it. But first, what is Joseph Heller’s most famous work about? Main Character: loosely, Captain John Yossarian (the novel circles around a number of other characters). General theme: How do the Air Force men fulfill their increasing number of missions while attempting to retain their sanity? I should also say that it is a satire. And, yes, it’s going to remind you of M*A*S*H. You will laugh, probably heartily. You will do far more than that, however: Catch-22 is a visceral ride (I am going to use flight analogies here, be warned). By the end — which took me three months to reach — you will be hung out, wrenched dry, and probably heaving (from laughter and nausea). I was bored — the generals and colonels made me want to run in circles and chase my own tail — and awed. I was haunted, not just after the fact, but during the reading: what happened to Snowden and Yossarian, after all? And the ending. I was prepared for a tremendous decline, a last falling drop. But Heller has a kind of last burst to propel us out with. Why not end with frenetic elation and possibility? Catch-22 has something of the retro-fantastic about it. You can’t believe it, but you’re not reading a fantasy either. That’s one of it’s powers, of course — Heller’s hurtling insistence that you must believe. One last note: What of the phrase “catch-22?” Heller did invent it, although his original choice was “catch-18.” Read the novel to create for yourself a full-bodied definition. I never really liked playing “I Spy” when I was younger, but I did love the I Spy Books by Jean Marzollo and Walter Wick. Do you remember them, those meticulously planned photographs and rhyming riddles? For this week’s Mystery Monday, we are playing a more grownup version of those much-loved childhood favorites. The library above is from the Manhattan apartment I cited in a previous blog post. Your challenge? Find the copy of Hemingway’s The Sun Also Rises the owner of this library has wisely chosen to include on their shelves. Still, the phrase “Friday forge-on” lives on. Yes, maybe it’s more of a G&T and a glass of sherry these days, but it’s the idea, darlings: something to reward yourself with for slogging through what can sometimes be the murk of life. While I sip my sherry, I’m here to offer you a little literary Friday forge-on. If you like it, perhaps we can make it a weekly treat? Today’s comes courtesy of the poet Amy Lowell. I’ve been reading her collection, “A Dome of Many-Colored Glass,” and this one is from that 1912 volume.